Introverts are people who draw their energy from within rather than from other people. They require a lot of time alone to recharge, and most people just take that as a sign that they don’t want to be bothered and aren’t interested in connecting with others. Let’s get real. Extroverts are more valued in our society than introverts, at home, in a relationship or in the workplace. We often speak about the struggles of introversion, but today we are here to rejoice its advantages. We’ve never met an introvert who didn’t have a high emotional intelligence or deep understanding of themselves. Below are few wonderful things, which introverts are good at! The way introverts process external stimuli makes them prone to over stimulation and sensory fatigue. Over time they learn how to pace themselves, so they can lengthen the time they are social. From the weekend’s, work breaks, to vacations, time that others use to party, socialize and engage in any number of activities, introverts will use to actually rest. Their heightened perceptions make a more prominent distinction between rest and low energy activities. They need time to build up energy and patience stores, and let their bodies and minds recover. There are a large number of people who could definitely benefit from adopting an introverted method of time and resource management. They know their limits and will do what is best for them. Even a seemingly tame and low energy event can quickly drain an introvert’s energy and patience. Don’t try to force them to stay, their fatigue will make them irritable and not the most fun to be around. On a more compassionate level, if your friend isn’t having fun, why would you make them stay? Many introverts express a talent or affinity for creative or artistic pursuits. Not all introverts are modern Picasso’s though. Their inherent creativity may reveal itself in unique perspectives or innovative problem solving. No matter the form of creative expression, most introverts excel at redefining standards, showcasing unheard of possibilities and implementing new methodologies on old concepts. The neurological pathways of introverts are longer than other personality types. Information is carried through more parts of their brain. This helps them commit more to memory, use more analytic parts of their minds and more time to process. They may seem slower in comparison to other personality types and more efficient. Introverts don’t look outside themselves for answers to life’s questions, because they know the only place they can truly find what they need is inside their own heart. 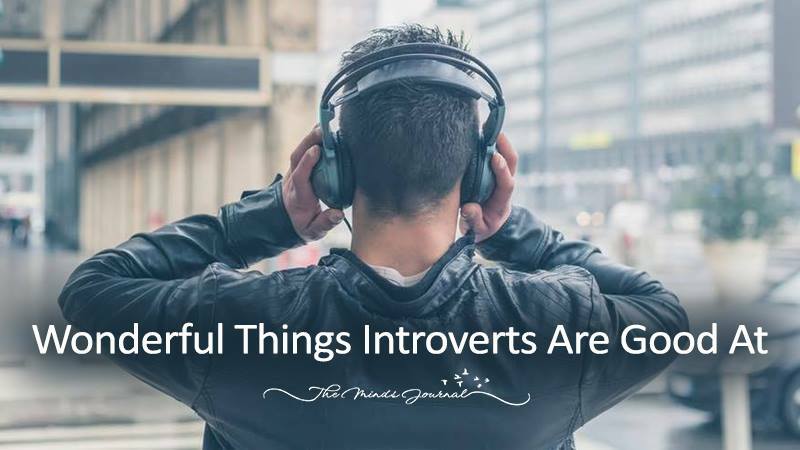 While social situations can be stressful and tiring for introverts, they have naturally occurring gifts that make them very competent at genuine communication and a strong understanding of other’s situations. You can do everything you can think of to hide your feelings or thoughts from them but they are likely to see through it. Actively participating and truly comprehending to someone as they speak, is a skill that most have to work at and practice. Introverts are usually inclined to be adept at making who they are listening to feel comforted by simply projecting a compassionate air. If you need a shoulder to cry on, a sincere sanity check, or just a honest conversation; introverts will almost always be a safe bet. If you bring them a problem you are struggling with, you can bet that they will help you look at it from every possible angle. They will walk with you through the confusion; helping you reason the facts, and weighing the options. Any person that doesn’t know or strive to understand themselves will have consistent difficulty in life. The potential for over stimulation, the effects of highly developed sense of empathy and perceived incompetence in social situations are a few of the specific obstacles facing introverts. Introverts have a tendency of feeling like they have to ‘catch up’ to the perceived competence of their peers. The most effective way to do this is through understanding and nurturing themselves. I’m not saying that all introverts are self realized gurus, rather the specific obstacles they face has a tendency of greatly strengthening the dialogue between them and themselves.